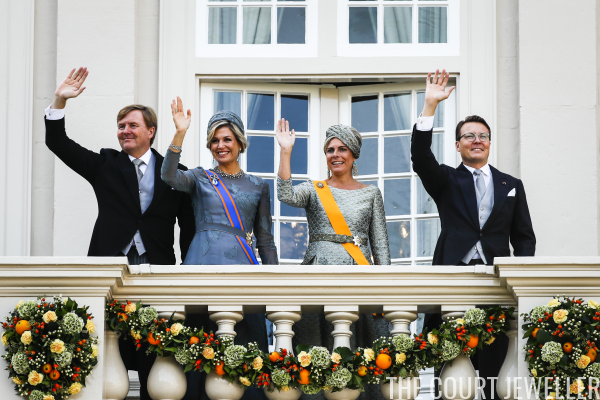 Following the destruction in the Caribbean after the recent hurricanes, this year's Prinsjesdag in the Netherlands was a bit more sedate, with muted colors all around. But we did get some glittering jewels to enjoy! 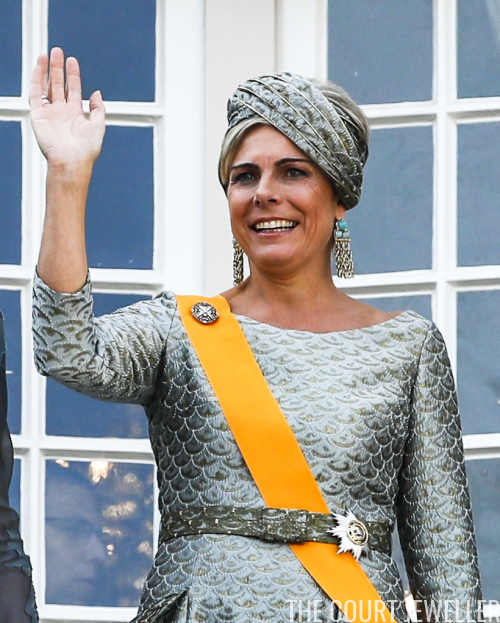 Queen Maxima accessorized her gray gown with diamonds and aquamarines, including one of my favorite Dutch royal jewels: the family's diamond trellis necklace in its all-diamond form. She also wore pieces from Queen Juliana's aquamarine suite, including the large brooch and earrings with the briolette drops. An aquamarine ring can just be spotted on her left hand. She also wore two of her go-to diamond bracelets: her wedding bracelet and the bracelet made of her family's initials. 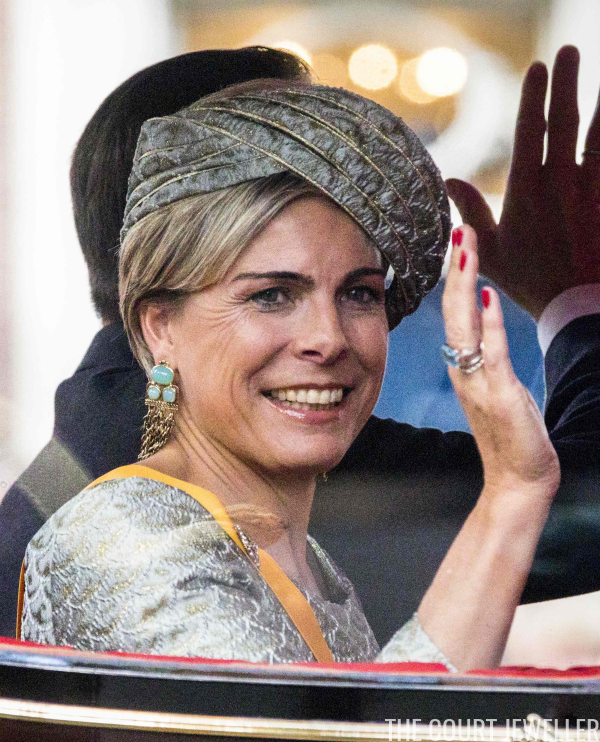 Princess Laurentien chose a pair of statement earrings with milky blue gemstones and chain pendants to coordinate with her silvery gown and hat. I also spy a blue ring -- perhaps aquamarine or blue topaz -- on her right hand. She secured her order sash with a small round brooch. 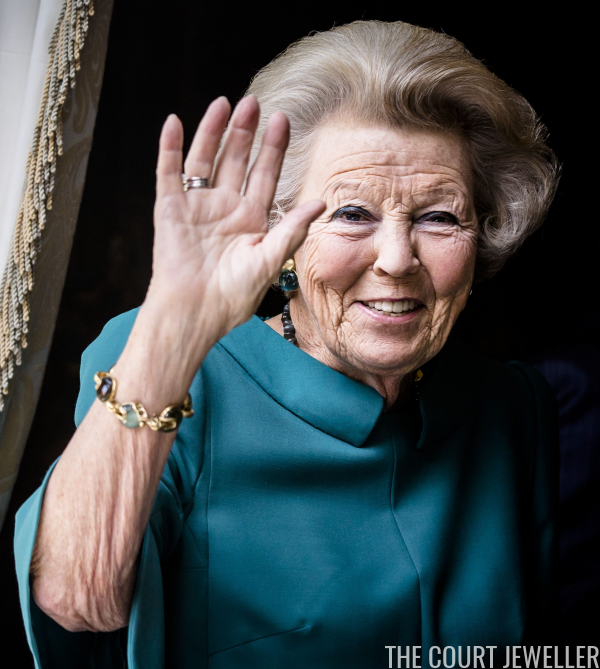 Not on the balcony, but present for the festivities, was Princess Beatrix, who wore colorful jewelry, including a bracelet that appears to be set with cabochon stones.